They seem to have a very good selection of chemicals at reasonable prices. I read their policy and don't see anything about not selling to individuals. I just created a test order that included HNO3 and I seemed to get all the way through the ordering process to where I would enter credit card information for billing. It said standard shipping was $7 - that seems a bit low when order includes 500ml HNO3. Has anyone ordered from this company before? A search of the forum for the name did not find any match. 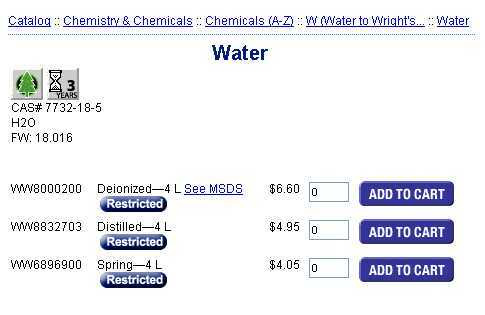 I've looked at that website before and was under the impression that I couldn't order chemicals. I just checked out their "FAQ" where they say you have to be a teacher to order "restricted" items. So I'll be surprised (and delighted) if you get your nitric acid. I have the catalog for Nothwest/Boreal Scientific. I tried a phone order once. I was unsucessful in obtaining chemicals as I "was not a school or business". I am pretty sure the two are similar as Boreal conglomerated with some other scientific companies. I've ordered equiptment from them without problem, but never any chemicals. Give it a try. Yeah its not letting me complete my order, even just for the platinum wire. It says that "restricted" items can only be shipped to a school. I will assume that you are a high school student. Any who follow what I did. Kind of going off of what Rouge scientist said... Prehaps if you make enough orders using my method POSSIBLY you might be able to earn their trust. This is just a possible "theory". I think the trust you have to earn is that of your chemistry teacher. The supply houses like to make the sale. They just have to follow their "rules." Selling to a school teacher is allowed by their "rules." Selling spring water to a private citizen does not fit within Boreal's "rules."